We are now one of the largest sources of fine, very high quality, Navy or white, silk, silk blend or wool Boys Communion suits as us ed for First Communion (or Holy Communion, Comunion is actually a misspelling). We are experienced (since 1952, over one hundred years of combined boys Communion suit and outfit experience) and have the knowledge of what is appropriate, what is practical, and what many others buying a suit for First Holy Communion before you have done. Unlike some shops, we recently visited Italy to once again scour the market for fine, white Communion suits. Once again, our Communion suits are made in Italy exclusively for us by Malip, an Italian fashion house that has specialized in Boys and girls dress and special occasion clothing for decades. It is possible that you have been wearing suits from us already. some smaller boutiques rely on our expertise and order their Italian suits from our Brooklyn, New York shop and warehouse. We believe that we are currently the only source for boy's suits and especially Communion Suits direct from Italy. We are proud of our personal and business relationship with the Malip family and their exquisite white suits for boys. A recent innovative new style is a unique silk blend ultra white ribbed fabric. The first samples of this suit have sold out in record time and, great news! More suits are available. This new look combined with our ability to customize details make the Navy or White Communion suits at www.BoysItalianSuits.com unique and one of a kind. While in the past many of the suits we have sold for First Communion have been navy blue we have noticed and responded to a need for fine white silk suits. We work with an Italian manufacturer of Italian White suits of a unique silk blend that is stark white without the polyester shine that most stores offer. We have found these are especially popular with our customers from Brooklyn, Howard Beach, Staten Island, Long Island and Westchester. 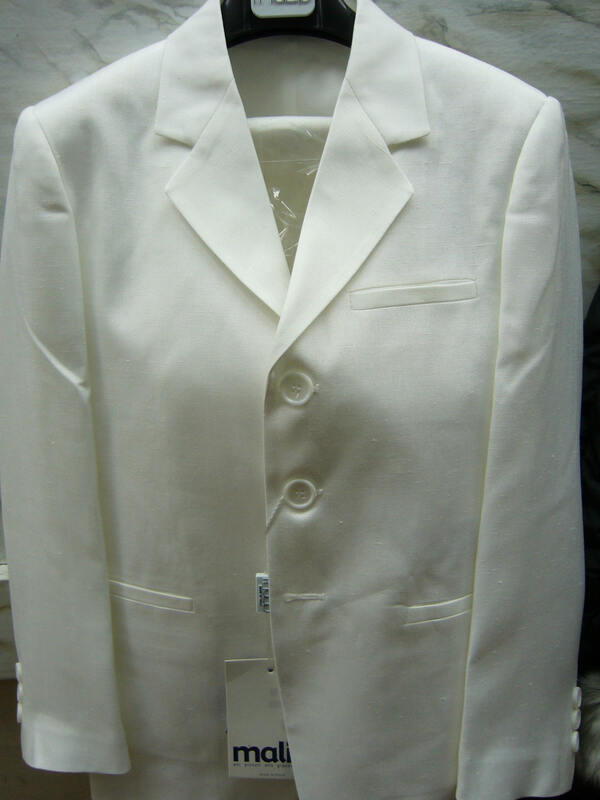 White, classic two piece Communion Suits range in price from $99 up to $415. We also offer multiple versions with matching vests, in standard fabric or with trim of Satin or brocade fabric. Some clients have customized with the buttons or ties in matching satin or brocade fabric. In short, if it is a really special white or navy boy's suit that you are seeking chances are that we will be the answer. We also are able to fit those boys with challenging size issues, we often have Malip (the Italian manufacturer) custom prepare a suit with size modifications if that is what is needed. We can modify any suit with size or fit modifications as well as styling changes to make a suit that is one of a kind, at a small surcharge. We have also obtained a source for WHITE COMMUNION TIES. If you have been searching for these ties, your search is over, just contact us. Price is $30, with a specially reduced sale price for ties purchased with a suit. We have also had our Italian shirt expert source an ultrafine white cotton shirt that is a customer favorite for Holy Communion outfits. Please browse our site, including our suit pages, or simply phone or visit us for assistance. Our contact information is at the bottom of every page, for your convenience. Our warehouse in Brooklyn is easy to reach from the N.Y., NJ and CT area, on the BQE between Staten Island and Queens or Westchester, NY.